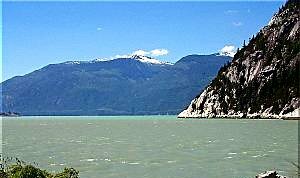 Driving north from Horseshoe Bay's BC Ferries terminal you will be taken along one of the world's most breathtaking stretches of oceanside road, the Sea to Sky Highway (Highway 99). A mere 60 km (37 mi.) 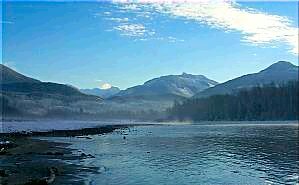 north of Vancouver, BC, takes you to a whole new world -- nestled where the glacial-silted waters of the Squamish River meet the Pacific Ocean. Enticing ocean coves are just waiting to be explored, towering cliffs waiting to be climbed and endless trails to be hiked or biked are just of few of the things you will see. These are but of few of the vistas and outdoor activities waiting for a visitor to Squamish -- the "Outdoor Recreation Capitol of Canada". 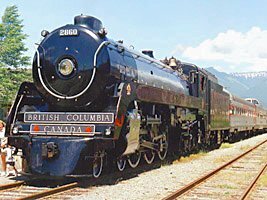 Visitors not only come to Squamish for the camping, fishing and other outdoor sports but also to take advantage of the BC historical sites in the area such as the mining museum and heritage park. 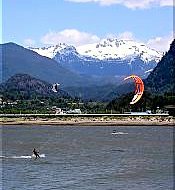 There are many communities and facilities close to Squamish that have a variety of activities. To the north, the four season mountain resort village of Whistler offers world class skiing and hiking while the many provincial parks offer endless opportunities for outdoor recreation. Accommodations: There are hotels, motels and B&B accommodations in Squamish as well as numerous lodges, resorts and public/private campsites close by.